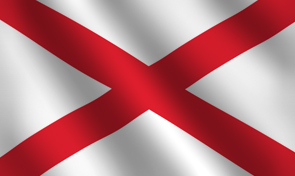 Originally inspired by the former Confederate battle flag, the Alabama state flag was first flown in February of 1895. The simple, yet bold design features the Crimson Cross of St. Andrew on a field of white. The diagonal X-shaped cross represents the cross St. Andrew, a disciple of Jesus, is said to have been crucified on.